Like Lino Martins, David Smith, of Lynnwood, also had to “come out of the Lego closet” at some point in his life. Almost literally. All it took was his granddaughter to open her mouth when he was dating Kelli Armstrong. “Do you know about the Lego closet?” the 4-year-old told Smith’s girlfriend one day. The revelation didn’t chase her away. On the contrary, Armstrong took up playing with Legos and ended up marrying Smith. The Lynnwood couple have now been married for eight years and Lego is still very much a part of their lives. “Now we have a full bedroom full of Legos,” said Smith, who still owns the first set he played with as a kid in the mid 60s. The Smiths calculate they have more than 200,000 pieces in their 15’x15′ room, where stacks of plastic boxes for each type of Lego brick fill rows of shelves on every wall. 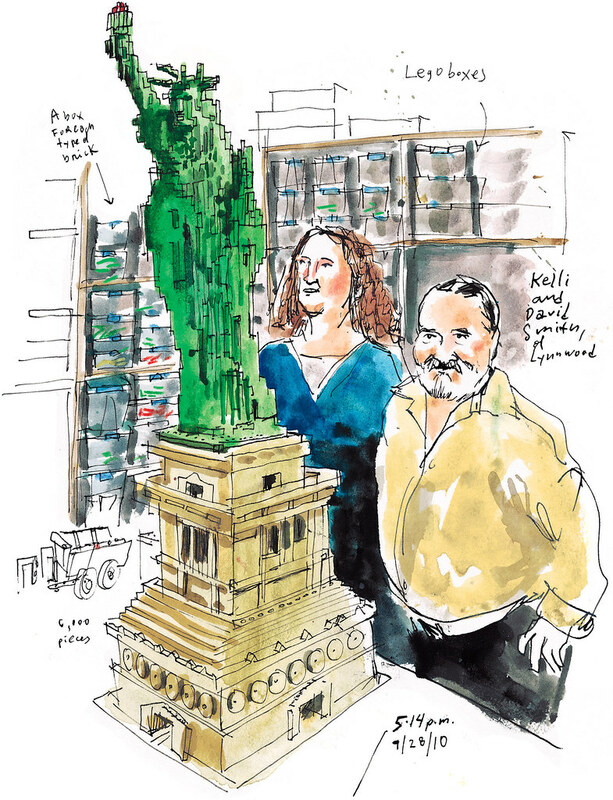 For BrickCon, they’ve built a 6,000-piece, 4-foot-tall Statue of Liberty that they plan to display at their law office. You can see hundreds of unique displays put together by registered participants like David and Kelli Smith at BrickCon’s public exhibit. It’s open from 11 a.m. to 3 p.m. Saturday and Sunday at Seattle Center’s Exhibition Hall.